Maudpl.8k.com is pleased to award you our 'Arts Award' award for your website. The Maudpl award is made to web sites who's intention is to provide the visitor with useful and informative content, with extra credit given to good design, decent graphics, ease of navigation and fast loading times. As your site scored over 98% against the overall judging criteria, we are pleased to present you with the Arts Award. 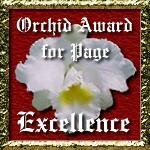 I am very proud to present the NEWLY designed "Orchid Award for Page Excellence" award to you, in recognition of your hard work in the creation of such an excellent page. I think you have done an outstanding job on your site! This award has been redesigned for the new millennium and I am sure you will be proud to display it on your page! Once again, Congratulations on an Excellent Web Site! We here at MMSeekers.com are happy to announce that your website has won our Creative Award. After we received your Award application, we visited your website, reviewed your information and concluded that your website is a High Quality page in both design and service offerings. Based on the fact that we here at MMSeekers.com enjoyed your Website, we would like to offer our Creative Award for display on your Website. Again, Congratulations today on winning our Creative Award, and please stop back by and Sign our Guest Book when you get the time. Good news, our awards panel have visited your site and awarded you our SILVER LEVEL AWARD. Judging is now conducted under stricter guidelines and currently rated 3.0 with A.S and 5 Star with The Paris Awards Club. Again my personal congratulations on a fabulous site. Congratulations! You are A Winner of The Golden Screen Award! The Barbara Tampieri Home Page is a wonderfully tasteful and stylish site that showcases the artwork within beautifully. You should be very proud of your work. Well done! We are aware of the time and effort that goes into creating a successful web presentation. First of all, we thank you for inviting us to your fine website and the opportunity to review it. Your website was reviewed by one or more of our evaluators, and it gives me great pleasure to report that your application was successful, and present you with our MAESTRO AWARD OF EXCELLENCE! Your site has been presented to a seniors group on the internet known as the 50+ Friends Club, established since 1995. Since early 1996, the Duke of URL's review has been a monthly, good-natured presentation, and also part of the 50+ers comprehensive site which has enjoyed over 110,000 visitors. The sites are selected for their interesting content, classy design and/or helpful inclinations. Your site, one of 20+ this month, has been presented in this month's seasonal presentation. Thank you for making a great site and have a wonderful holiday season. It is with great pleasure to present you with our gold award. We spent a couple hours looking through your site and what a remarkable amount of varied material you have for your guests. We especially liked that you give something extra to your viewers - postcards and calendars! Thanks so much for applying for our award and inviting us to view and evaluate your site. It was such an honor for us to do so. You have won our award. Your site is really excellence. You have won our Bronze Award. This award is given for an excellent likeability and a good quality of the art works exhibited. The presentation and usability of your site is good and pleasant. We are aware of the time and effort that goes into creating such a web site, that's why we are very pleased to present you with the KARA ART BRONZE AWARD. Congratulations... After doing a thorough review of your site...it gives me great pleasure to award you with my Creative Design Award. It's quite obvious you have put your heart and soul into the creation of your site... please continue to share your special gift the way you do. Congratulations! We at AWT have found your page meets our standards for the award you applied for. You have a GREAT site! We loved the art and photos. You will be a welcomed addition to AWT. We would like to thank you for submitting your web-site for review. Your site has been reviewed by all our judges. Your site scored 86 out of the 100 available points. So... Congratulations! Your website "Barbara Tampieri Home Page" has met with the criteria needed to win our Historic and Cultural Heritage Silver Award! You have won our award for your very excellent content, easy to navigate, good loading time and very original graphics. This site is the latter from sites reviewed by us in a 2000! "Historic and Cultural Heritage of Perm region"